One thing that I love is that I haven’t been able to find a stock that’s not listed. The new directory features live data on every stock traded on the DJIA, S&P, NASDAQ, TSX and more. Essentially, if you’re looking for any mainstream stock, you’re going to find it! Interactive Trading Chart – On the directory, you will find an interactive trading chart that you will be able to customize to provide the exact data you’re looking for. Price – The directory also includes the real time price at which any stock is trading. This includes the previous close price, the market open price, as well as the current trading price. Finally, you will also see a day range section that gives you an idea of the high and low prices for the day. Price Target – Through the directory, you can see an average price target among all analysts that are weighing in on the stock. The price target is based on one year growth projections. Volume – Trading volume is incredibly important. When we see big movements in the market, it’s likely the result of high volume on the stock. At the Modest Money stock directory, you can see the average daily volume on the stock as well as the current volume for the current session. Earnings & Capitalization – As an investor and analyst, it’s important for me to know data with regard to market capitalization as well as earnings. At the Modest Money stock directory, you will have access to the current overall market capitalization of a stock as well as the most recent quarter’s earnings per share, the price to earnings ratio, and dividend and yield information. Key Stats & Financial Data – This has to be one of my favorite section so the directory. In this section, you will find everything from net profit margin to operating margin, EBITD margin, return on average assets, return on average equity, the amount of employees the company has and the CDP score. All of this information is vital to the proper analysis of any stock. Company Information – When investing, you want to take time to get to know the company you’re investing in. So, in the directory, you will be able to find the Wikipedia description of each publicly traded company, as well as the address and website link for the companies. Expert Analysis – It’s always a good idea to watch analyst movements closely when investing. As a result, the Modest Money stock directory offers an expert analysis section that will give you a great view of how analysts feel about the stocks you’re interested in. News – We all know that when it comes to the market, there are few things that have the ability to cause movement like positive or negative news. At the Modest Money stock directory, you will have access to all the recent news and headlines from all around the web. Tweets – Finally, the ultimate driver of movement in the market is investors themselves. In the directory, you’ll find a tweets section. This section gives you a list of recent tweets surrounding any stock, which will give you a strong idea with regard to where investor sentiment is headed. While there’s already a ton of information available through the Modest Money stock directory, Jeremy is a mad man, and he’s got his mind set on being the best! So, there’s tons more to come. He hasn’t even shared what he intends on adding to the directory with me quite yet, but considering the work that he’s done thus far, I have to say that I’m pretty excited to see what’s coming down the road! When Jeremy first brought this to my attention, I was impressed. However, I definitely didn’t think that the final product would be so intuitive. I’ve come across several tools that have less information, but require paid access. 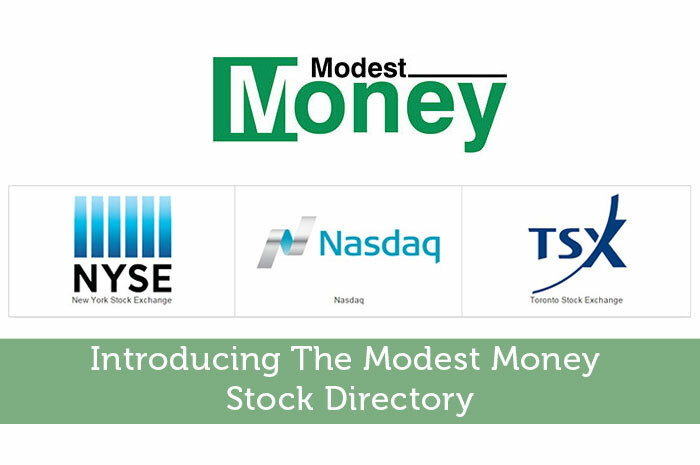 At the moment and for the foreseeable future, the Modest Money stock directory is and will be free for all users! So, if you’re looking for a place to get all the data you need without jumping from site to site and without having to pay $99 to $299 per month for access, you’ve found it at the Modest Money stock directory!